New year, new smartphone - it still applies to most smartphone manufacturers and also to Huawei. The new P30 Pro is here and is causing a lot of excitement. But is it really that much better than its predecessor? We've made a comparison between Huawei P30 Pro and P20 Pro. Let's first look back: With the P9, Huawei had really shaken up the smartphone industry. Its successor, the P10, was then hardly more than a gentle upgrade. Meanwhile, the P20 Pro, with its groundbreaking triple camera, was a huge step forward again. This doesn't look good for the new Huawei P30 Pro if the series continues like this. But hold your horses, because Huawei has quite a few features to offer with the P30 Pro, and many of them come from the Mate series. 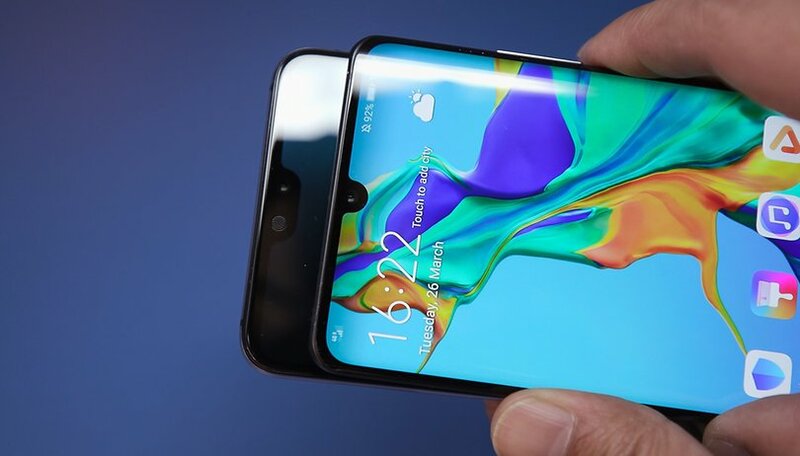 From the Mate 20 Pro, the P30 Pro has copied its slightly curved display on the sides, on the P20 Pro the screen was still completely flat. The P30 Pro also carries the fingerprint sensor (like the Mate 20 Pro) under the display. In the P20 Pro it sits on the front and takes up valuable space that could actually be used for the display. In fact, the display of the P30 Pro is a little bigger than that of the P20 Pro, but the resolution remains the same at Full HD+. It's actually a little bit less than that, but with good AMOLED panels, this is no problem. As the screen got bigger, the notch shrank, because the P30 Pro only has one in the dewdrop style. Huawei did this by removing the earpiece - the new smartphone reproduces the sound for calls directly from the display. One thing is more than good enough on both Huawei smartphones: the cameras. The P30 Pro has a 32MP instead of a 24MP front camera, and the P30 Pro also has a TOF camera that can record a detailed depth map of the surroundings. The upper limit remains at 40 megapixels, but Huawei removes the monochrome camera of the P20 Pro and replaces it with the ultra-widefield lens of the Mate 20 Pro. The telephoto lens is now mounted horizontally and even creates a tenfold hybrid zoom. The P20 Pro stops at fivefold zoom. A glance at the technical data of the two Huawei smartphones reveals that the differences are not particularly large. The P30 Pro has a new processor and a little more memory, but the performance of the P20 Pro is still more than up to speed. The battery topic becomes more interesting, as it is a little weaker in the P20 Pro, but the previous year's model also has a smaller screen compared to the P30 Pro. This will be an aspect in our full review of the P30 Pro. In the end, it's the look that counts, and Huawei still has a lot to offer. The P20 Pro brought the Twilight look with its color gradient, while the P30 Pro refines it further and additionally offers a noble white and a bright orange-red version. All well and good, but with the slippery glass back, the phone will often end up in a case again. If I had bought a Huawei P20 Pro, I wouldn't switch to the P30 Pro. Of course, the Huawei P30 Pro offers a few more improvements: a better zoom, a larger display, a new fingerprint sensor, a new processor, and slightly more memory. But the jumps aren't so big that you have to feel outdated with the predecessor, the P20 Pro. If you bought the Huawei P20 Pro last year, there are few concrete reasons to spend a lot of money on the P30 Pro again 12 months later. Which smartphone do you like better? Choose “Huawei P30 Pro” or “Huawei P20 Pro”. Rounded corners is not a feature, it's an annoyance! Sorry I would never pay a thousand dollars for a phone with a 6.4 display and having it only 1080p!